We are often asked why we started Autistry Studios. The answer in a word: Ian. 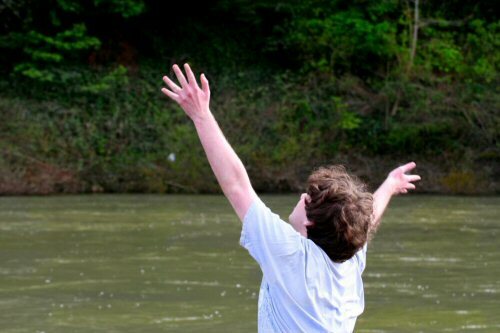 Our son is autistic and his autism has driven much that we have done and learned. 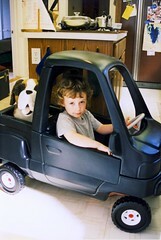 Ian was born early in 1995 while we were living in Bloomington, Indiana. Dan was a Ph.D. candidate at Indiana University studying Astrophysics. Janet was a librarian at the local public library and was working on her Masters degree in Library and Information Science at IU. Towards the end of the pregnancy Janet’s blood pressure started to increase and she was diagnosed with preeclampsia. 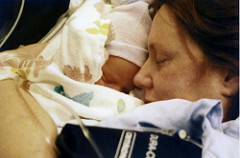 As her due date approached her doctors worked to induce a normal delivery. After nearly two weeks Janet’s condition deteriorated to eclampsia and Ian was delivered by emergency c-section. 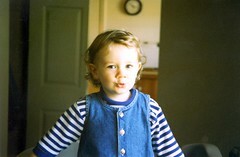 Ian was full term and a very healthy baby at birth. But as the months passed he began to miss the usual milestones of speech development. We had one of those “What to Expect…” books and noted with increasing worry and dread each “normal” milestone he missed. He did not babble in a speech-like way in the early months. He was not drawn to noise-making toys nor did he imitate different speech sounds. He seemed totally mystified by games of Peek-a-Boo. But he always smiled. He made eye contact. And he loved to be held. Ian seemed to communicate without words. And though we thought his utter fascination with cupboard door hinges, the pliability of a sheet of paper, or the concentric ripples in a dog’s water dish was a bit eccentric we simply chalked it up to being the son of a scientist. We took comfort in the stories that Einstein didn’t speak until he was 3 years old. 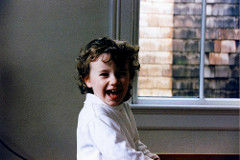 Even though Ian never measured up to the What to Expect timelines he nevertheless developed into an attractive, engaging and affectionate child. The news brought both agony and a sense of relief. We knew little about autism and that which we did know was frightening. Janet had read a few books on autism as they passed across the checkout station at the library. But those books contained stories of children living in a bubble world, uninterested and seemingly unaffected by the people around them. Ian was always aware of other people. Though at parks he did prefer to study the tires of parked cars rather than play with the other children in the sandbox. So when the doctor diagnosed autism we immediately had a vision of a child forever lost to us. But there was also a part of us, deep down that knew Ian was different. Having the doctor validate these feelings with a word – autism, actually gave us a certain peace. But, it also set us on a path to learn whatever we could, about autism and about our very unique little boy. Soon after Ian’s third birthday we made an appointment with Dr. Bryna Siegel. 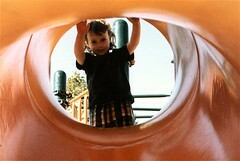 Dr Siegel was, at that time, the director of UC San Francisco Autism and Neurodevelopment Program. We had had the preliminary diagnosis from our local pediatrician but, like most parents, we wanted a second opinion. After several hours of testing, Dr Siegel came back with a diagnosis of autism. Along with her reputation for being a fine clinician and an expert in autism, Dr. Siegel is known for her direct and even blunt presentations to parents. She lived up to that reputation in our meeting. She said that Ian was definitely autistic and that she did not consider him to be in the upper 20% of autistic individuals who would live independently. She gave the example of Temple Grandin only to say that Ian did not seem to be like her. She considered Ian to be a “low-functioning autistic”. The worst diagnosis they give. Dan remembers that the only literature he could find was that people with that diagnosis had an 80% probability of being institutionalized as adults. At that time there was very little literature to look at and none was particularly encouraging. UCSF had a list of many things they wanted Ian to do with them but we quickly saw that all they were interested in was studying Ian, not treating him. The lack of guidance as to what we should do was very upsetting to us. But Dr Siegel also said that it was difficult to tell how a three-year old would develop and that a lot rested on how well he could learn. And she remarked on Ian’s charming temperament and his engaging personality. “He is very attractive and that will help him enormously at school. Teachers are going to love him.” And they did. When it became obvious that caring for an autistic child was a full time endeavor, Janet gave up trying to hold down high-powered, high-paying tech or film industry jobs and concentrated on creating a quiet, nourishing environment for Ian. As parents of autistic children know only too well this was a round-the-clock job. 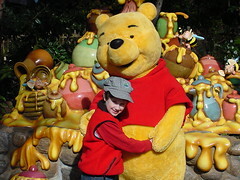 Ian, like most young children, loved Winnie the Pooh. When he first began to talk he would stay up all night reciting long passages from the Disney movies. His lilting sing-song voice was not a good lullaby so Janet was up all night with him. So she too memorized the Winnie-the-Pooh dialogue. One night as Ian recited the well worn lines Janet took the part of Tigger – “The wonderful thing about tiggers, is tiggers are wonderful things…” Ian whipped his head around, looked her right in the eye…and then burst into laughter. She had entered his world. That was the first night he fell asleep before 3am. Janet had found a way to connect with him in that very special world of his imagination. Years later, when she became a therapist this became her primary method – to enter the world of her clients, join with them in their inner dialogues, and support them as they enlarged their worlds to include others. As the parents of a newly diagnosed autistic child we entered a world where it felt like every week brought a new Thing We Could Do to Cure Our Child. Music! Horses! Computer games! No computer games! Magnets! We looked into all of them. Everyone we knew sent us literature they had found. “Have you tried…. ?” There was constant guilt that we were not doing enough. Constant frustration when the weekly “cure” turned out to work on ONE child in the entire world. And then friends would keep sending us information about that same cure for the next month. We came to call this: living with the threat of a cure (that you did not take advantage of!). Some things helped and we are thankful for them. Going to a gluten free-dairy free diet did help us tremendously. The diet made it possible for Ian to sleep through the night without meds and that was the year he learned to read because he was actually able to attend to lessons. We tended to shy away from the programs which required working Ian huge hours. We stuck with things where he would work hard and then have sufficient time to play on his own and with others. We found that consistency was the best antidote for anxiety. We tried never to be late picking him up from school or appointments. We made our lives as regular as possible –eating meals at the same time every day, going to bed and getting up at the same time, and keeping over-stimulating events to a minimum. Our world became smaller. Friends and family found us boring. But Ian stayed relatively calm and happy. In Ian’s schooling we generally received good service by collaborating with the districts as best we could. We tried wherever possible to provide extra help and materials to support the classroom teachers. And we mostly managed without huge legal battles – that is not to say that there were never heated negotiations. But the outcome was always agreed to be in Ian’s best interest. Ian is currently a senior in high school and will graduate with a certificate of completion with the same group of kids he has been with since fourth grade. 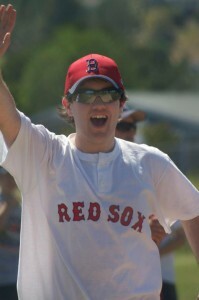 Ian was born with autism but he was also born with a charming and engaging personality. 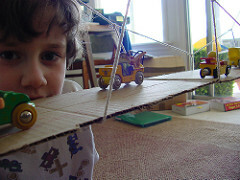 It has been our job as his parents to protect that lovely person as we also help him understand and accept his autism. This entry was posted by Janet Lawson, MFT on Thursday, February 20th, 2014 at 9:49 am	and is filed under Commentary, Writing. You can follow any responses to this entry through the RSS 2.0 feed. Both comments and pings are currently closed. I love the blog. Your journey has taken turns you never expected, I’m sure, but you’ve accomplished so much for some special kids as well as their parents. I’m proud to know you.